You wouldn’t think that a melodic death metal band from Finland playing on a weeknight would attract a large crowd, but Insomnium’s show at Trees in Deep Ellum this past Monday night brought just that. The scorching heat didn’t deter the most dedicated of fans from standing in line at 6:00pm, a full hour before the doors opened, to participate in a meet and greet session with the Finnish metal masters. After the meet and greet was finished, the doors opened to the public and the show kicked off with local openers Blackstone and Sworn to the Sword. Blackstone @ Trees, Dallas, TX. Photo by Corey Smith. Blackstone brought a very straightforward, rock and roll metal vibe to the stage. The crowd was still trickling in as the band knocked out a handful of songs during their allotted set time of 30 minutes. A mix of thrash and rock-influenced melodies filled the room as vocalist and guitarist Jesse Greenstone led the charge, trying to get the crowd involved in the set. I did feel a lack of energy during the performance as a lot of back-lined equipment was taking up the stage, but the lack of movement was countered with well executed riffs and powerful drumming. Sworn to the Sword @ Trees, Dallas, TX. Photo by Corey Smith. Next to the stage was Sworn to the Sword. Another local band, formed in 2013 under the original name of “Fenris,” Sworn to the Sword brought their interpretation of melodic folk metal to the Trees stage. Clad in kilts and face paint, the crowd could immediately anticipate what was about to occur. Sworn to the Sword has gone through multiple member changes throughout the years, but has stayed true to their style. The only current original member is Alejandro Sacripanti on bass. Pete Brown (vocals), Andrew Huff (drums), Braulio Granado (guitars), Stephen Hawthorne (guitars), and Elizabeth Wesson (violin), rounded off the medieval folk sound, as the band opened the set with three songs from their upcoming album The Calling. The band overcame some technical difficulties and sound issues during the set, but closed it out strong with the track “King of the East” from their previous album, Across the Darkened Skies. Oceans of Slumber @ Trees, Dallas, TX. Photo by Corey Smith. The first touring act of the evening was the Houston band, Oceans of Slumber. I hadn’t heard of this band until the tour announcement and intentionally did not listen to any of their albums before the show. I wanted to experience the band for the first time in a live setting and immerse myself in the music. To say that I was blown away would be an understatement. From the first chords struck by guitarist Sean Gary and Anthony Contreras, to the hauntingly beautiful vocals of Cammie Gilbert, I instantly knew that Oceans of Slumber was incredibly passionate about their work. The set was filled with sadness, beauty, suffering, and pain. The crowd could feel every ounce of emotion pouring from the stage. It was the kind of performance that makes your skin crawl. Beautiful harmonies, precision drumming, and melodic hymns, coupled with ferocious doom and thunderous bass, Oceans of Slumber demands to be heard. The set was filled with songs from the band’s March 2, 2018, release The Banished Heart including the opening track on the album, “The Decade of Disregard,” as well as the set closer “No Color, No Light.” The crowd was left in awe as the set finished with tears of pain and joy rolling down the face of violinist Cammie Gilbert. Do yourself a favor and go see this band the next time they are in a city near you. Insomnium @ Trees, Dallas, TX. Photo by Corey Smith. Up next was the mighty Insomnium from Joensuu, Finland. Insomnium knows the formula for melodic death metal, and they know it well. The band is still on the road supporting their latest album, Winter’s Gate, which was released two years ago. To be supporting the same album for two years takes some balls, but if you’re Insomnium, you can pull it off. The large Monday night crowd was immediately schooled in melodic death metal as the band opened the set by playing the entirety of the Winter’s Gate album. Unfortunately, founding member and guitarist Ville Friman wasn’t able to make this tour. Being down a guitarist, Nick Cordel (ex Arch Enemy, Arsis, Sanctuary) was brought in as a special guest musician. Nick’s guitar playing fit in seamlessly with Niilo Sevänen (bass, vocals), Marcus Hirvonen (drums), and Marcus Vanhala (guitars). The band had the crowd, young and old, headbanging and singing the night away. After they played Winter’s Gate, the band continued with tracks from Shadows of the Dying Sun, Above the Weeping World, and One For Sorrow. 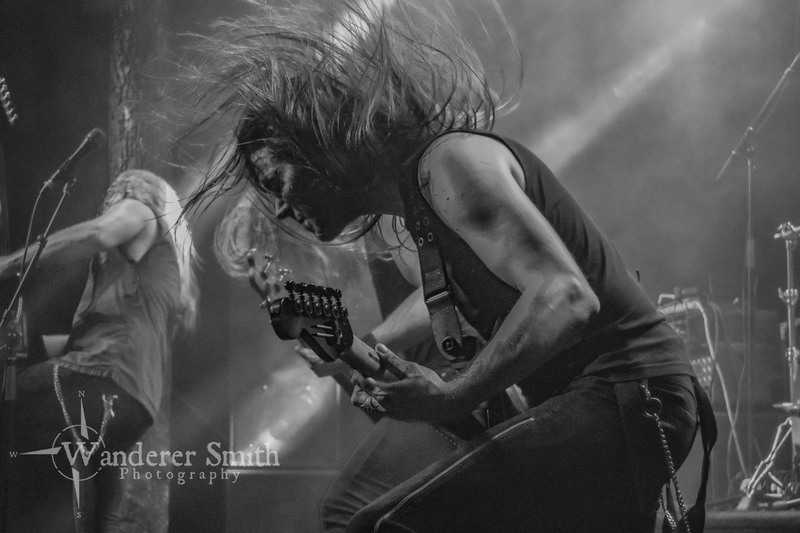 The atmosphere that Insomnium brings to the stage is like no other. A truly professional band that is passionate and dedicated to their craft. Insomnium sticks to their formula and continues to impress with each passing year. I will continue to see them live every chance I get.